If you’re able to see, but struggle doing everyday tasks because of poor eyesight, you may have low vision. For people with low vision, glasses, contacts, and even surgery cannot make their sight better. This is debilitating, but there are ways to cope. Here are tips to thrive despite your low vision. 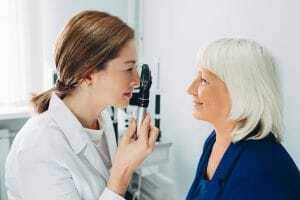 How Does Low Vision Develop? Low vision can occur from a variety of scenarios. It’s typically caused by age-related macular degeneration or eye diseases like cataracts or glaucoma. People age 65 and older most commonly develop low vision. Eye injuries and birth defects can also trigger low vision. Low vision is essentially having severe visual impairment. People with low vision have difficulty recognizing faces—even of friends and family members. For them, doing everyday tasks, like picking out matching clothes, can be extremely difficult. Without the proper tools, living alone with low vision can be very dangerous. A doctor that can act as your advocate is essential. A trustworthy doctor can listen to your own unique concerns and recommend the best support services and adaptive technology. Your struggles with low vision are bound to be different from that of others, and a good doctor will recognize those differences and cater to them. Although you won’t necessarily reverse your lost vision, rehabilitation can help you cope with what you have. Skilled rehabilitation specialists can provide adaptive training to live independently. They’ll improve the lighting, remove any hazards, and use color contrasting to in your living space. In addition, they can recommend technology, like magnifying tools, to help you see with more ease. Living with low vision can be demoralizing, but it’s important to stay strong. Don’t be afraid to recruit help from family and friends. They can act as moral support and help with tasks that aren’t safe for you to do. Looking for the right eye doctor to help you through your low vision journey? Book an appointment with your Valley Eyecare Center eye doctor today. Call us at 602-955-2700 or schedule online.